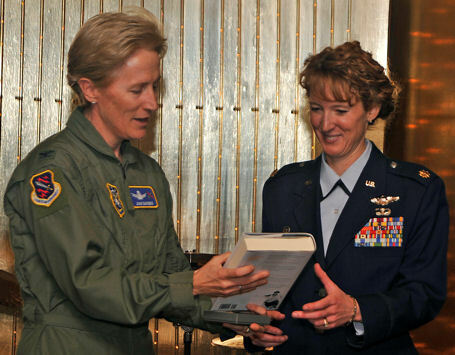 Maj. Melissa May (right) receives a book and 21st Space Wing memento from Col. Joan Sandene during the Women's History Month luncheon March 17, 2010, at Peterson Air Force Base, Colo. Major May, a senior F-16 Fighting Falcon pilot who earned a Distinguished Flying Cross medal for a 2003 mission over Baghdad, was the luncheon's guest speaker. Currently, she is an air officer commanding, or AOC, for Cadet Squadron 21 at the Air Force Academy. Colonel Sandene is a 21st SW individual mobilization augmentee. PETERSON AIR FORCE BASE, Colo. (3/24/2010 - AFNS) -- Maj. Melissa May was at a holiday party with her squadron at Kunsan Air Base, South Korea, a few years ago when another officer sidled up to her. "What are you doing?" he said. "You shouldn't be wearing lipstick. You need to decide, either you're a fighter pilot or you're a chick." She smiled and took that as a huge compliment, she said. It just so happens that she is both and loves it. In a humorous and inspiring commentary, Major May told her Air Force career story March 17 at the 21st Space Wing's Women's History Month luncheon. The luncheon was one of five events here, including a five-kilometer run/walk and a health fair, to celebrate Women's History Month during March. opportunity to do exceptional things. The story of how she became a fighter pilot began in 1991 when she was a first-year cadet at the U.S. Air Force Academy. Major May chose the Academy because she had a penchant for adventure and hoped she might get to jump out of an airplane. "I didn't know anything about the military," she said. She could name only one aircraft, an F-16 Fighting Falcon, she said. But when an instructor asked a group of cadets what they wanted to be, one by one they said, "Sir, I want to be a pilot." Not wanting to stand out, she yelped, "Sir, I want to be a pilot." And she named the only aircraft she could remember: "F-16s, sir." "You'd better scrap that dream," he told her. Major May graduated from the Academy, married a classmate and served as an intelligence officer. Every day she briefed pilots about defensive maneuvers. They took her information and went out and executed, she said. She did an about face into a cubicle with no windows. "After a while, I was like, 'This stinks! Why do they get to do that? I want to do that,'" she said. Timing is everything. In 1997 the Air Force needed more pilots and she got her shot. Her husband, Maj. Mike May, took advantage of this need as well, and both attended pilot training school within six months of each other, followed by F-16 training. This was four years after Congress changed the rule to allow women to fight in combat. Still, Major May was the only woman in her F-16 training class. "It was pretty eye-opening," she said. "It was definitely a man's world at the time. I had some instructors who definitely thought women should not be in fighters." Fast forward to March 20, 2003, the first night of Operation Iraqi Freedom. Major May's team was given the mission to destroy several missile sites. Both that mission, and another that followed four days later were successful, and she earned the Distinguished Flying Cross medal. "It was neat to think that 10 years prior, women weren't flying combat at all," Major May said. "And here they were trusting me to take out a brand new lieutenant and fly across the border into Baghdad on night one." She teases her husband, whose squadron was on its Air and Space Expeditionary Force rotation overseas just prior to Operation Iraqi Freedom, that when the war started they brought in her squadron, "the A team." "When we have grandchildren some day and they say, 'So Grandpa, what did you do in the war?' he can say he was back home hosting coffees while Grandma went over, dropped bombs and took out missiles." A few years ago, the Mays decided it was time to start their family. When Major May became pregnant, people wanted to know if she would get out of the Air Force. It never crossed her mind, she said. Everyday moms make tough family and career decisions and she did too. "A thought that went through our minds is that it's great for our son to see his mom and dad doing equal jobs and we are so happy with our jobs," she said. "It's important for him to see his parents working hard and having a complete passion for our careers." Next stop for the Mays is Aviano AB, Italy, where there will be new adventures for them with deployments and childcare, she said. "It will not be easy," she added. "We'll do our best to give 100 percent to everything. We'll figure it out." But she is certain of this: when a female cadet today says she wants to fly F-16s, nobody laughs or tells her to scrap that dream. Today, women make up 19.4 percent of the active duty Air Force and 4.3 percent of pilots, according to the Air Force Personnel Center. Major May, just by telling her story, aims to get those numbers even higher. "I'm the first officer these cadets get to know and meet and hear about the Air Force," she said. "For all they know, there are a thousand female fighter pilots and that's the way it's always been." Sixteen-year-old Chandra Sundaram, who attended the Women's History Month luncheon with her parents, said she was inspired by Major May's comments and that she wants to be a pilot. Chandra is enrolled in the engineering track at her high school and has her sights on the Colorado School of Mines. In sixth grade, she learned she had 20/20 vision, and her mom said that she could be a pilot.